In celebrate the start of Spring yesterday, here are some pics from my garden. I have so little time I kind of neglect it, but sometimes it all turns out anyway. 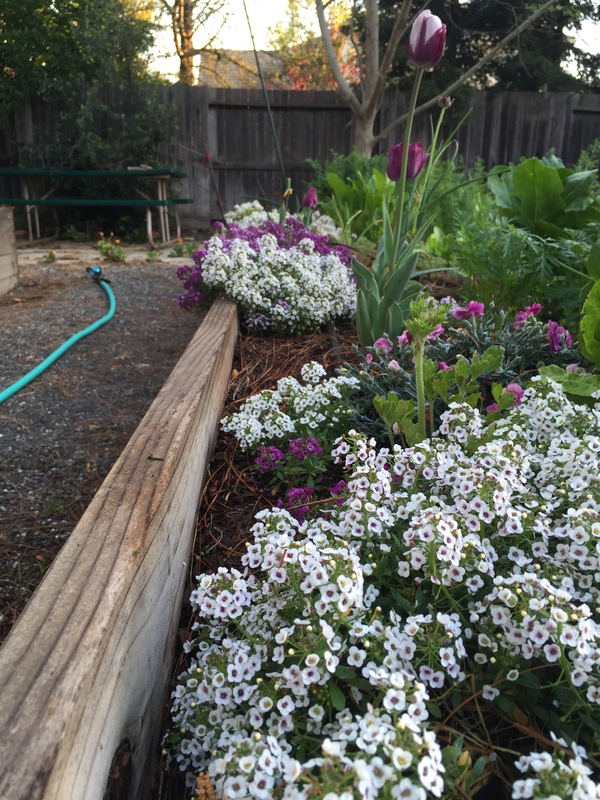 Above you can see the edge of one of the beds with over-wintered & self-reseeded sweet alyssum in white and purple. Intermixed I have tulips and miniature carnations, with the latter surviving the winter. The climate in Davis, CA can be very mild in the winter and this year that was especially true. I like the combinationof purple and white overall. To the right of the flowers are various veggies that grew over the winter and are now exploding including lettuce, beets, dill, carrots, and cilantro. 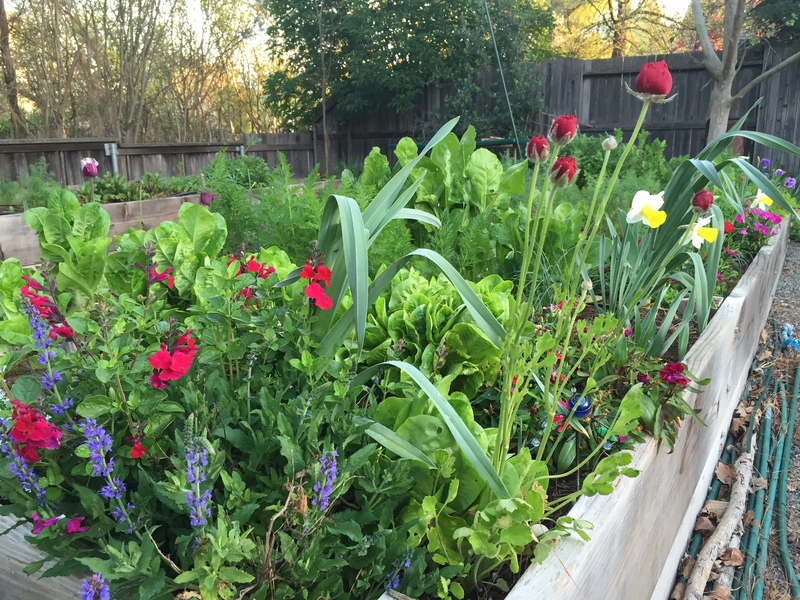 Here you can see all kinds of flowers in a gardening riot mixed with veggies. Then below is a nice sunrise viewed from the garden. Got to stop working on one’s grant early in the morning and go outside sometimes. Thanks for a very nice blog. It gives me the opportunity to stay updated, learn and follow the new agenda in the world of stem cell scientists. 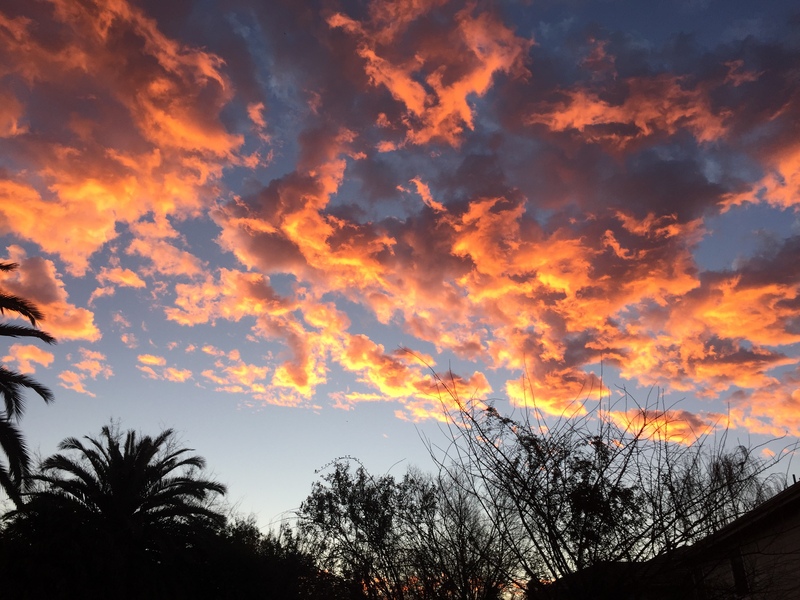 I think beautiful moments from the nature, such as your garden or a sunrise, is equal to the beauty of seeing a cell stained in a immunohisto section that you have search for. We need them both to be able to continue on our path. Thanks. I agree about gardening. East coast so looking forward to seeing Mother Nature don her spring attire, your photos are beautiful…sigh!